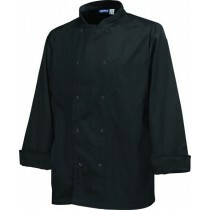 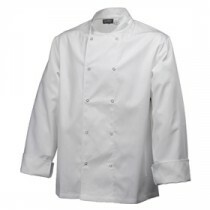 Chefs jackets in a range of shapes and styles. 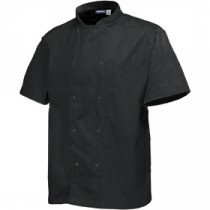 Look smart and keep cool. 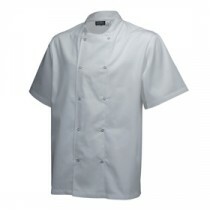 Genware Basic Stud Chef Jacket Short Sleeve White XS 32"-34"
Genware Basic Stud Chef Jacket Short Sleeve White M 40"-42"
Genware Basic Stud Chef Jacket Short Sleeve White L 44"-46"
Genware Basic Stud Chef Jacket Short Sleeve White XL 48"-50"
Genware Basic Stud Chef Jacket Short Sleeve White XXL 52"-54"
Genware Basic Stud Chef Jacket Long Sleeve White XS 32"-34"
Genware Basic Stud Chef Jacket Long Sleeve White L 44"-46"
Genware Basic Stud Chef Jacket Short Sleeve Black XS 32"-34"
Genware Basic Stud Chef Jacket Short Sleeve Black M 40"-42"
Genware Basic Stud Chef Jacket Long Sleeve Black M 40"-42"
Genware Basic Stud Chef Jacket Long Sleeve Black XL 48"-50"